In the infectious disease world, the liver-damaging hepatitis C virus (HCV) long has lived in the shadows of killers such as HIV/AIDS, tuberculosis, and malaria. But curative—and expensive—HCV drugs that have come to market over the past 5 years have focused new attention on the deadly disease. Now, for the first time, researchers have mapped its U.S. prevalence state-by-state. They hope their model ultimately will help improve targeting of efforts to screen for the virus and treat the more than 3 million people in the country who are living with the infection. The new study finds that the highest levels of HCV infection in 2010 were in the western United States. At the same time, eight states—California, Texas, Florida, New York, Pennsylvania, Tennessee, Ohio, and Washington—account for more than half the cases. HCV is spread primarily when people who inject drugs share their needles and syringes. The work, published in Clinical Infectious Diseases today, was conducted by researchers from Emory University and the U.S. Centers for Disease Control and Prevention, both in Atlanta. The findings weave together population data from what’s known as the U.S. National Health and Nutrition Examination Survey (NHANES) and death records and numbers from the U.S. Census. A new, interactive map created by the group, HepVu, shows the geographic distribution. But the researchers say it underestimates actual HCV prevalence. That’s in part because the study looks only at the noninstitutionalized population, which means it does not include people in prison or those living on the streets. It also does not capture sharp, recent spikes in viral spread because of the country’s opioid epidemic: Reported cases of “acute” HCV infections—which indicate recent transmission—jumped 158% between 2010 and 2014. Emory epidemiologist Patrick Sullivan, whose team earlier created a popular interactive map called AIDSVu, discussed the new work with Science Insider. The interview has been edited for clarity and brevity. Q: Why are you turning to HCV now? A: It’s especially timely to take a deeper look at hepatitis C, which since 2012 has led to more deaths in the U.S. than the combined number from 20 other diseases in the country, including HIV and pneumococcal pneumonia. There’s also been an update to the national Viral Hepatitis Action Plan, which spells out the challenges to improving our national response. 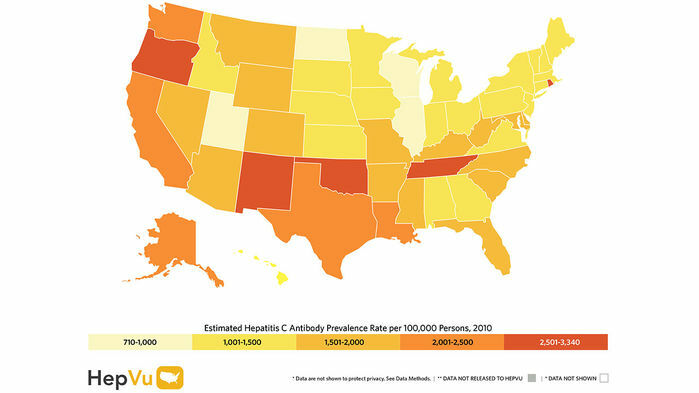 We need more information about geographic distribution of viral hepatitis. One of the underlying issues is that the surveillance systems for hepatitis C are not as robust as they are for diseases like HIV, which are nationally reportable case by case. Q: Why does your report focus on the presence of antibody to the virus? A global hepatitis report issued by the World Health Organization just last week shifted to measures of actual viral levels of HCV rather than antibody, in part because some people with antibody have spontaneously cleared their infections. A: From a public health perspective, antibody indicates the scope of people who need to be engaged. The 10% to 20% of people who have antibody but are not currently infected still need that initial screening. Q: You estimate that at most 3.9 million people in the United States have HCV antibodies. How many of those people do you think actually are infected and need treatment? A: Some 2.7 million are estimated to be living with chronic hepatitis C infection. However, the NHANES estimates of antibody prevalence and chronic infection do not include people who are institutionalized or homeless. Studies that are more inclusive of other populations suggest there are 3.5 million people in the United States who are currently infected. Q: How do you think this information will help target responses? A: As we find with AIDSVu, part of this is helping people understand the epidemic where they live. There’s low awareness among health care providers in some places. It may also lead some people to realize that hepatitis C is a problem in their state, and then seek testing or accept screening if it’s offered. It also gives states a benchmark of the public health challenge they are facing. Q: What places were you surprised to find had high levels of hepatitis C? A: Tennessee, Oregon, and Oklahoma. They’re also not states that have had the most robust data. Q: Some states and locales make it more difficult for drug users to obtain clean needles. Have you done an overlay of a map that combines this information with your own data? A: We have not, but that’s exactly the kind of question we hope our map will lead people to ask. When you start mapping things, people start having ideas about what they’d like to see mashed up with it. We hope people begin to interrogate the data and ask what’s related. Next Post Will vaccine help curb new Ebola outbreak in the DRC?